This issue of Endocrinology and Metabolism Clinics, edited by Drs. 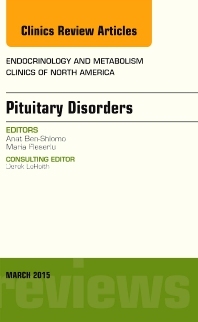 Anat Ben-Shlomo and Maria Fleseriu, is devoted to Pituitary Disorders. Articles in this issue include: Pathogenesis of Pituitary Tumors; Prognostic Clinicopathological Classification of Pituitary Adenomas; Familial Isolated Pituitary Adenomas (FIPA) and Mutations in the Aryl Hydrocarbon Receptor Interacting Protein (AIP) Gene; Pitfalls of IGF1 and GH Assays; Acromegaly: Pharmacotherapy; Hypothalamo-pituitary-adrenal Axis Testing; Pharmacotherapy of Cushing Disease: New Targets; Prolactinomas; Non-functioning Pituitary Tumors; Cabergoline Use for Pituitary Tumors and Valvular Disorders; Aggressive Atypical Pituitary Tumors and Carcinoma; Outcomes of Endoscopic Transsphenoidal Pituitary Surgery; Efficacy and Complications of Pituitary Irradiation; Hypopituitarism: GH and ACTH Deficiency; Hypophysitis; Hypopituitarism After Traumatic Brain Injury; Quality of Life in Pituitary Diseases; Pituitary and Bone Disease; Pituitary Tumor Management in Pregnancy; and Pituitary Apoplexy.